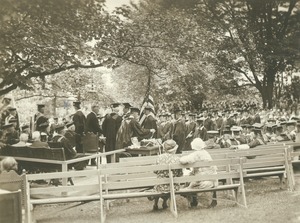 Massachusetts - Massachusetts Governor Joseph Buell Ely delivers his Commencement address to a crowd in the campus Rhododendron Garden. 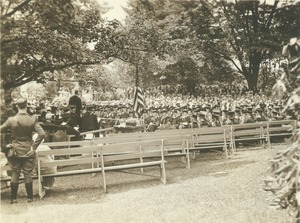 "Commencement - 1933 MSC - Gov. Ely" written on back along with "Jan Munson".